Apple launched the original iPad amid much fanfare back in 2010 and it has done very well in its own right, but sales figures haven't been anywhere close to those of the iPhone. In recent years, Apple's hardware and software teams have put in a lot of work refining the focus of the iPad. From being a device designed largely for watching videos, reading, or playing games, the focus has slowly been shifting towards professional use. Sure, the company still sells the iPad mini 4 and the iPad (2017) for consuming content, but the bulk of Apple’s recent innovations have been reserved for the iPad Pro models. 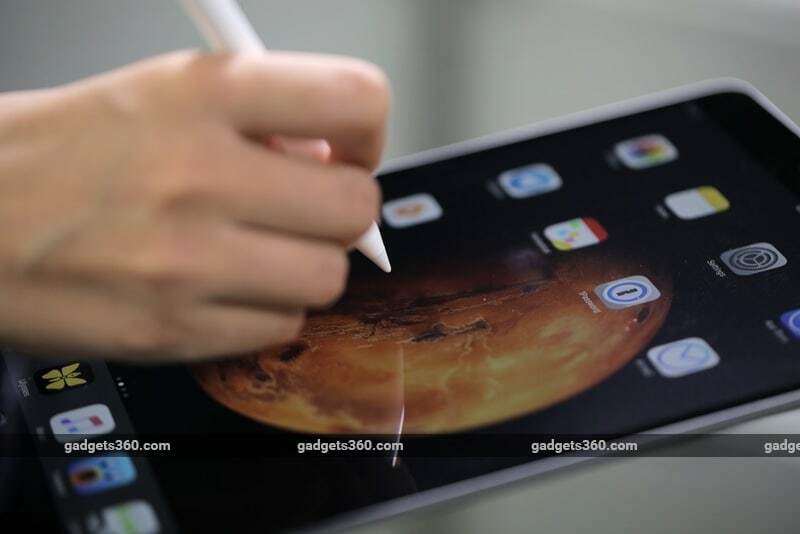 We first saw this with the launch of the iPad Pro (12.9-inch) (Review), when Apple also unveiled the Smart Keyboard and Apple Pencil along with software features such as Picture in Picture, SlideOver, and Split View modes. That was Apple's first serious attempt at multitasking on an iPad, which could make it more likely to replace a laptop for some people. Writers and artists, in particular, found this very useful. Following that we got the iPad Pro (9.7-inch) but iOS 10 did not bring about the big push that iPad software needed, which meant it was largely the same package as the bigger iPad Pro in a smaller body. Now, Apple has replaced the 9.7-inch model with its new iPad Pro (10.5-inch), which packs some awesome new features. But from a software perspective, iOS 11 looms on the horizon and promises to bring some exciting new features to the iPad. But before we go any further, let's take a look at the differences between the iPad (2017) and the iPad Pro, in case you've been wondering which one is for you. The iPad Pro has a newer, faster, more battery efficient processor; a much better display; and improved cameras. Just like earlier Pro iPads, it supports the Apple Pencil stylus and the Apple Smart Keyboard cover accessory, both of which don’t work with non-Pro iPads. The iPad Pro (10.5-inch) has been launched before iOS 11 is due to release, which means that not all of its most useful features will be available to users who buy one right now. With iOS 11, iPad users will get a much more functional dock with more icons, a new file manager app called Files, much better drag-and-drop functionality, and improved multitasking. Since iOS 11 is still in beta, we used iOS 10.3.3 throughout our review period. 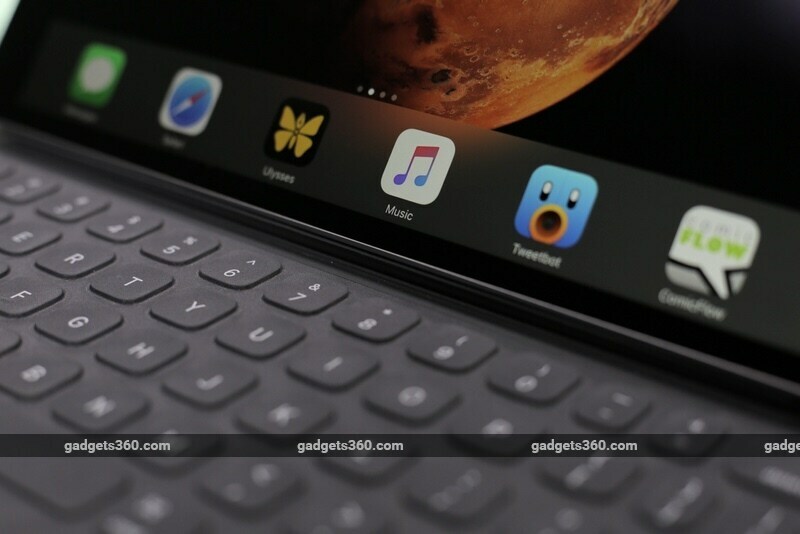 The display is one of the standout features of the iPad Pro (10.5-inch). It supports a refresh rate of 120Hz, which results in extremely smooth animations across iOS. You’ll notice this most when swiping between home screens, opening apps, and switching between them. The iPad Pro’s display has a wide P3 colour gamut, which means that reds and greens are more vibrant, something you'll notice while watching videos and scrolling through photos. It's hard to describe how good the display is because it’s the kind of thing you understand only when you see it in person. Just like the 9.7-inch iPad Pro, this iPad also gets a feature called True Tone, which adapts white balance based on lighting conditions to ensure that colours appear consistent. This is very useful for those who edit photos or videos on an iPad and is another reason why the iPad Pro is great for professionals. After using the iPad Pro regularly for nearly two weeks, we can safely say that its display is much better than that of an iPhone 7 (Review). Animations are much smoother and colours are more vibrant on the iPad. Switching to a MacBook Air was almost painful because it doesn't even have a Retina display. Initially, we noticed some backlight bleeding on one edge of the display and also saw some black bars appearing when we opened tabs on Safari but those issues disappeared after we factory reset the iPad and did not reappear during the duration of our review. While the iPad Pro (10.5-inch) has a stunning display, that doesn't automatically make it the best device to watch videos on. We downloaded a few HD videos via Netflix and streamed a few cricket matches on the iPad Pro (10.5-inch) to see if the display appears just as good. The results were mixed at best. The iPad has a 4:3 display, while most video content on the Internet is 16:9, which means it won't be optimised for the iPad's screen. This results in annoying black bars the above and below the video. We streamed the movie John Wick on Netflix and that film, in particular, left almost half the screen empty as the video was probably optimised for a much wider screen. Yes, all HD movies and TV shows we watched looked great on the iPad Pro (10.5-inch) but let's not forget that this isn't the device that creators are optimising their videos for. After using the iPad for two or three days, we noticed several smudges on the screen. These were fingerprint marks from our prolonged gaming sessions and even some from the Smart Keyboard accessory that Apple sent for review. We had to keep cleaning it every few days, which got tiring very fast. A display as good as this also makes low-resolution elements on screen look doubly annoying to look at. We visited several websites where low-res ads looked so bad that we seriously started considering installing an ad-blocker. Several of the games we played on the iPad Pro (10.5-inch) were coded well before this device was released and that left a lot of small low-res elements on screen. Games such as Banner Saga and Table Tennis Touch feature an awfully low-res Game Centre banner that you can't get rid of. This iPad has a fantastic display but that does not mean that the experience will be fantastic all the time. The iPad Pro (10.5-inch) is quite similar to the iPad Pro 9.7" in terms of build quality. While the display is larger, the iPad’s body isn't that much bigger because the bezel is much thinner. There's still enough room on either side to grip the iPad Pro without touching the screen accidentally. The front camera is above the display and the home button with the Touch ID fingerprint sensor is below. The iPad Pro (10.5-inch) has volume buttons but no mute switch on the right, a button Apple's tablets ditched a few generations ago. 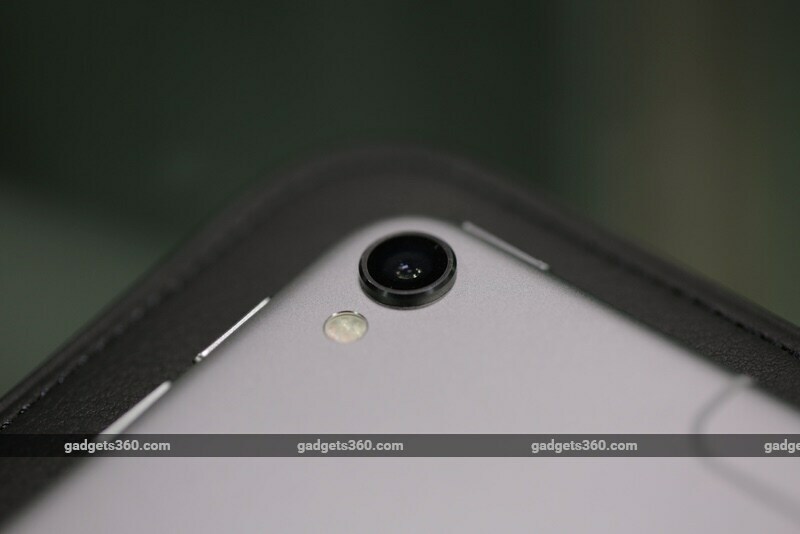 There's a 12-megapixel camera with a bit of a bump at the back. There's a Lightning connector for charging or plugging in headphones on the base of the iPad, plus a 3.5mm headphone jack at the top along with the power button. So far, Apple hasn't removed the 3.5mm headphone jack from any device except the iPhone 7 and iPhone 7 Plus (Review). If the iPad Pro (10.5-inch) is any indicator, Apple doesn't plan to remove it jack from non-iPhone devices and that's good to see because several users still need it. You can't expect a DJ to change his entire audio setup simply because one device doesn't have an industry-standard jack. The weight of the iPad Pro is still under 500 grams, which is impressive. We used it to read comics and watch movies during our commute to work, apart from using it to play games at home. It’s comfortable to hold and we think it is just the right size to be a great portable gadget for reading and watching videos. The iPad Pro (10.5-inch) is powered by Apple’s own A10X Fusion SoC which is a variant of the A10 chip which powers the iPhone 7 and iPhone 7 Plus. This is a pretty powerful SoC and we faced no performance issues during our time using the iPad. We treated this iPad as a replacement for our MacBook Air for the duration of the review. The first question to answer is whether the iOS platform has enough "pro" apps to justify buying this device rather than a laptop. Apps such as Ulysses, Affinity Photo, and Tayasui Sketches (Free, Pro) are just a few of the good "pro" apps that allow you to do things you'd normally only do on a laptop. We've bought quite a few iOS games and heavy apps over the years, and now the ecosystem is robust enough for us to consider a switch. To describe our typical workflow: we'd have at least 10 tabs open in Safari at any point, plus Apple Music playing in the background, and the writing app Ulysses for our daily work. During breaks we fired up games such as Table Tennis Touch, Banner Saga, and Transistor. We also used Netflix to watch HD movies. We'd keep switching between these tasks and also check in on our messaging apps, email, and Tweetbot. In all of this we never noticed any performance issues. Switching between apps and tasks was smooth, and we didn't even have to reload Safari tabs, a problem we faced a lot with older iOS devices that ran out of RAM frequently, but the iPad Pro lineup has typically been generous in terms of the amount of RAM it ships with. We were quite impressed with the battery life of the iPad Pro (10.5-inch) as well. It lasted for 10 hours with the screen on, which included watching videos with the nice stereo speakers (which are known to consume more battery power compared to plugging in a pair of headphones). We also noted that we could get around 30-40 hours in standby depending on how frequently we used the device. Most people will have to charge the iPad Pro (10.5-inch) once every two or three days, which is excellent compared to a laptop doing the same work. The iPad Pro (10.5-inch) has a pretty good 12-megapixel camera too but this review was honestly the only reason we even used it to take photos with. It might be a good camera but we don't see ourselves using an iPad as our primary camera simply because it's too unwieldy. Apple also sent us the Smart Keyboard case for the iPad Pro (10.5-inch) and we are glad that it did. 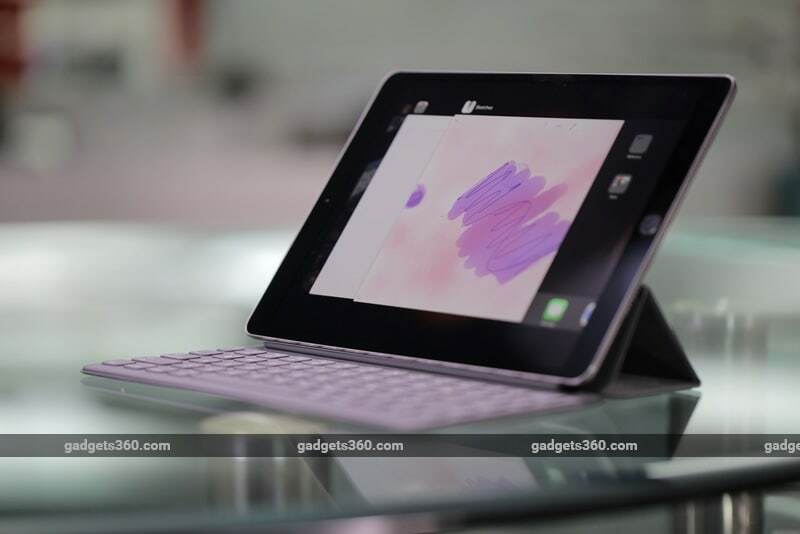 The Smart Keyboard is a sturdy case, apart from being a reliable typing tool. We also have a Logitech K480Bluetooth keyboard that we use every day and we can safely say that the Smart Keyboard is a better accessory for the iPad Pro (10.5-inch). We typed quite a few long articles (including this one) with the Apple Smart Keyboard case and had no trouble. Typing is crucial to our jobs as writers and we were able to type around 700 words in 30 minutes on the Smart Keyboard. We got used to the keys very easily and found that we didn't make any more errors than usual. 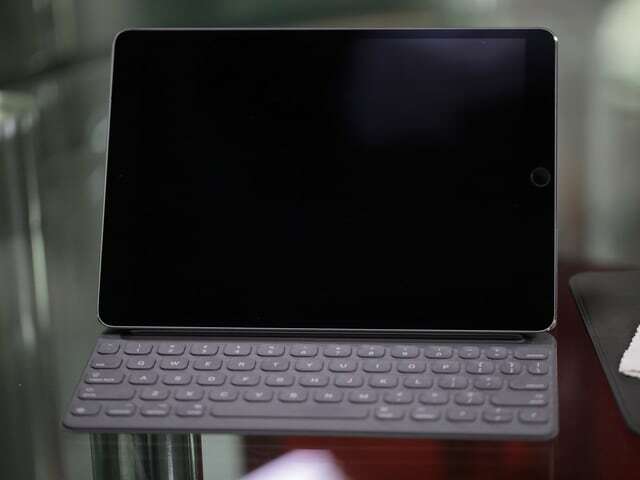 The Smart Keyboard doesn't require charging or pairing since it transfers power and data through the Smart Connector on the side of the iPad. This is a big deal because charging and pairing are the two most annoying aspects of almost all Bluetooth accessories. The iPad can recognise several common Mac keyboard shortcuts such as CMD+Tab, so you can minimise the need to reach out to the touchscreen on the iPad. Many shortcuts you already use on the Mac also work on iOS when any keyboard accessory is attached. Pressing and holding the CMD key on your keyboard shows you the list of shortcuts available in any app. However, the Smart Keyboard doesn't have an Esc button, which we sorely missed. Every time we had to just cancel some action, we had to hit the touchscreen, and that isn't something you want to do a lot when you’re trying to be productive. While the Smart Keyboard is among the lightest keyboard accessories you can find, if all you need is a case, it's on the heavier side. The added weight makes the iPad Pro a little uncomfortable to use when you're watching a video or playing a game, for example. The Smart Keyboard case is quite expensive at Rs. 13,900. We have no hesitation in recommending it but if you don't mind carrying a separate Bluetooth keyboard around then you can easily get the job done for much less. 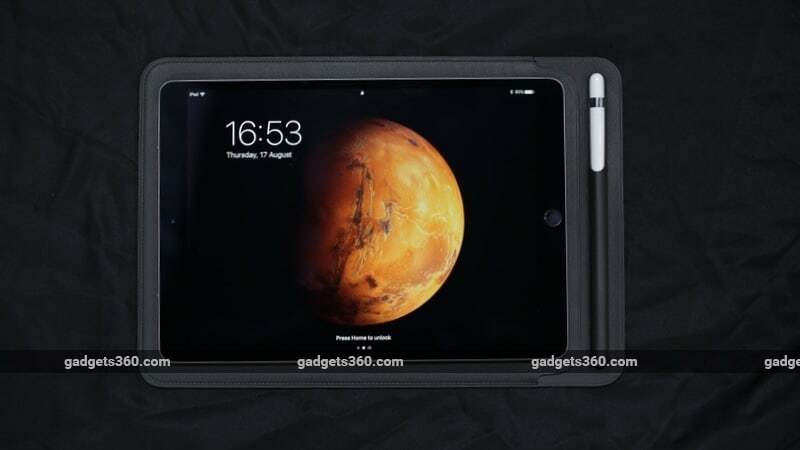 An Apple Smart Cover for iPad Pro (just the case minus the keyboard) costs Rs. 4,500 and a branded Bluetooth keyboard will set you back by another Rs. 1,500 to Rs. 2,000. The Apple Pencil is a stylus that's targeted at artists, which means that we aren't really the core audience for it. We did use it with drawing apps such as Paper by FiftyThree and Tayasui Sketches just to see how it works. We found it to be pretty good for doodling in both apps, and the iPad's palm rejection was exceptional. When we used the Pencil, the iPad Pro (10.5-inch) didn't register our hands touching the screen at all. We used the Pencil to take notes while recording podcasts and it was a splendid pen-and-paper replacement for that purpose. The Apple Pencil costs Rs. 8,600, which isn't too expensive if you need it for professional use. Our biggest worry was that we'd misplace the Apple Pencil because the iPad doesn't have a dock or silo for it. However, Apple’s Leather Sleeve for the iPad Pro has a neat little case for the Pencil as well. The quality of the leather is excellent, and the iPad fits in it snugly even with the Smart Keyboard attached. The price of the sleeve is Rs. 11,500 and if you just want a separate Pencil Case then the price is Rs. 2,500. The sleeve is really nice but we find its price hard to justify. We weren’t able to use it for long enough to comment on its durability, but we hope that it won’t wear easily. As we all know, iOS 11 is coming soon with a lot of iPad-specific improvements. Once it is out, the iPad Pro (10.5-inch) will be good enough to replace the MacBook for a lot of people. If you use your laptop just to browse the Web, watch videos, write, listen to music, and perform other basic tasks, then the iPad Pro is an excellent gadget for you. It can do most of these things without breaking a sweat – but so could the less expensive iPad (2017). During our review, we tried our best to avoid using our MacBook Air but we couldn't manage it completely. Our podcast recording setup requires USB ports, which the iPad doesn't have. Our Web publishing backend doesn't work well on Safari or Chrome on iOS, so we used the MacBook Air to upload articles too. Other than those things we spent entire days working on the iPad Pro (10.5-inch) without ever feeling the need to return to the laptop. The iPad Pro is not a MacBook replacement just yet but it is slowly getting there. Apple has built a premium tablet with an excellent display that delivers great performance in a market where there is virtually no competition. There's absolutely no doubt that the iPad Pro lineup is a big part of Apple's overall strategy. When iOS 11 releases, it will show how serious Apple is about its intention to pitch the iPad Pro models as productivity-oriented computers for professionals, not just entertainment devices. As we noted in our Samsung Galaxy Tab S3 (review) recently, the Android tablet experience is nowhere near as polished as we’ve gotten used to with Apple’s iPad lineup. That means the iPad Pro (10.5-inch) has a pretty big lead against all other tablets currently on the market. Its nearest competitor would be the iPad (2017). It doesn’t have as good a display or processor and it also lacks the Smart Connector required for Apple’s neat Smart Keyboard case, but it’s a lot less expensive. If the Pro’s extra features don’t matter to you and you want a tablet for casual use, the iPad (2017) is a good choice. Pricing for the iPad Pro (10.5-inch) starts at Rs. 50,800 for the 64GB Wi-Fi variant and goes all the way up to Rs. 84,500 for the 512GB Wi-Fi + LTE variant. Add the cost of a Smart Keyboard and an Apple Pencil and your total investment is going to be quite a lot. However, if you want the best hardware in the most portable form factor, you will have to pay a premium and for many people, the iPad Pro (10.5-inch) will be worth it.